Warning: long post! the first in a series covering some of the events I’ve attended or been involved with lately. At January’s London Internet of Things meetup, I had the privilege to hear Haiyan Zhang speak with passion about various topics, including how she had collaborated with hackspaces in Japan in the aftermath of last year’s earthquake and subsequent nuclear disaster. It was only the first time I’d come across Haiyan, so I was surprised but delighted that she invited me to the OpenIDEO Make-a-thon this past weekend, after tweeting about events like the London Green Hackathon. I had only a vague idea what to expect of the Make-a-thon. When I saw some of the project briefs being published ahead of the day, I knew that it would be a little different to hackathons and other tech events I’d been to in the past. The briefs spanned issues such as improving local communities, bike safety, and several supporting campaigns by Amnesty International to use technology to support human rights activities. My initial impression that it would not be a “run of the mill” tech event was reinforced when I arrived at the IDEO offices in Clerkenwell on Friday afternoon – it was a very different crowd to the ones I typically encounter – full of product designers, makers, human factors specialists, as well as web coders and developers. I rocked up with a bunch of Nanodes and other electronics with a vague thought of doing something hardware-related, but in the event I didn’t get that far! IDEO’s typical approach to design revolves around prototyping and directed brainstorming, and in the event we divided into 8 teams of around 6 each, with diverse skills but with common interests around the briefs on offer. Friday afternoon was spent first understanding and exploring the brief, and then rapidly prototyping a rough idea before presenting it to the rest of the group. Saturday was spent refining the idea and producing an “experience prototype” which was intended to have been tried out “in the real world” if possible. Several of the briefs interested me, but I joined the team focused on the concept of Postcode Gangs – how could we build something to develop and improve community facilities within a postcode – essentially an arbitrarily-delineated area – in London? We spent some time brainstorming ideas around what “makes” a community before needing to rapidly decide on something to build for our rough prototype. “What if” – there was a ringing phone in the middle of the street – and on the end of that phone, someone who knew something, had something to offer, or who was needed something? “What if” – we could create a new local hub with current and historical information about an area, enabling people to explore and meet their neighbours? So the first prototype of what came to be called Karma Phone involved a lamppost (named, erm, Dan!) with a phone on it, which would randomly ring as people passed by – people could call it with a need and that others could then try to address. On the other side of the lamppost (also known as, Dan’s back) we imagined a large touch display with information about current events, realtime information, historical maps, and so on. The team changed overnight, as Hayley and James were not able to stay for Saturday, Lydia joined us, and Victoria could only be involved for a short time on Saturday. We weren’t all convinced that a ringing phone would be answered, that the system wouldn’t be abused, that there wasn’t a social barrier around providing home address and asking for help, etc. How could we get an actual phone into the street and ringing, too? So, Saturday morning involved some rapid rethinking of what we wanted to build! 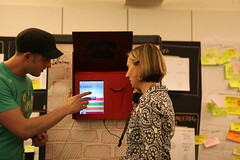 We settled on what turned out to be a subtle evolution of the original idea – a public phone which could act as a hyperlocal information service and skills exchange. While we were brainstorming how to hack a physical phone, run a long cable into the street, use a mobile chained to a metal box, etc etc I remembered Twilio, which I’d been following for a long time, but never had the chance to hack on in anger. Within about 30 minutes I’d demonstrated the ability to initiate calls between two users from a web page, to the rest of the team. Steve and Dan set about implementing the web UI; Tim started working on a physical enclosure; Victoria and Lydia managed to source a real “traditional” phone handset; and I remained hard at work writing PHP to talk to Twilio. network issues meant that I had to use Tim’s phone to tunnel through to my webserver’s console, since it was apparently impossible via the event wifi. Evidently IDEO had just had a network provider change, so it was just an awkward time, but I lost some time fiddling with hosting in the early part of Saturday. at a certain point on Saturday afternoon, I realised that attempting to call from the Twilio web client on the iPad was never going to work… since it requires Flash. I thought of a number of workarounds, but the one that finally stuck was that we were able to use Skype on the iPad, and use the skype:// URI scheme to launch the app from the web client. It wasn’t seamless as we needed Skype credit, and also had to tap an extra “call” button in order to start the call, but it was good enough for a prototype. I’d wanted to make the web app, a standalone launchable web app on iOS. Weirdly, adding the usual meta tags to the page header to instruct iOS to treat the app as standalone launchable, meant that it was no longer possible to invoke Skype from within the web UI… so I backed off from that idea. The only cosmetic issue that presented was an inability to hide Safari “furniture” like the header, but that wasn’t a big problem for a prototype. I spent so long coding and tweaking on Saturday (the commented and documented code is here – ignore how short it might seem – it was an intense few of hours!) that I missed most of the physical assembly. Tim and Dan did an amazing job of creating an enclosure for the iPad and handset. It might have been made from foam board, a box folder, and vinyl, but the final result was beautiful. And most importantly – it was fully functional! We would have loved to get the prototype out on the street for public testing (I suspect none of us more than Steve and Lydia! ), but time worked against us. The final experience prototype was presented as a live demo with willing audience volunteers – one example call going to an answering service, and the other redirected to the local expert on Scotch Eggs (Tim!). So – conclusions? I really enjoyed the way we worked together as a team of very unique and different talents; and seeing the Karma Phone prototype realised so brilliantly. However, I also think the experience of the Make-a-thon was humbling… listening to the experiences of people illegally detained abroad, and seeing some truly brilliant ideas from all 7 of the other teams, was wonderful. 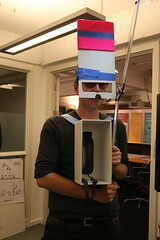 A huge thank you to everyone involved in the first IDEO Make-a-thon – a really unique hackday. The IDEO team in particular looked after us brilliantly, with superb facilities, a great welcome, and more-than-adequate quantities of the hacker staples (coffee, sweets, pizza and beer). Read a full recap including information on all of the project briefs on the OpenIDEO site. There’s a gigantic set of photos from the IDEO team, and a much smaller one from me shot on an iPhone at lower quality. Tim, Dan, Hayley, Victoria, Steve, James, Lydia – Thank You. It was a pleasure! All of the other teams – you rocked. You did great things. I salute you! This entry was posted in blog and tagged #ideomake, amnesty international, community, development, Hackathon, ideo, karma phone, London, makeathon, php, postcode, prototyping, twilio. Bookmark the permalink. The Skype workaround was clever! For some reason “I rocked up with a bunch of Nanodes” made me laugh, not that I know what Nanodes are. I think I packed extra Blu-tac. Thanks for the recap! Clearly a very innovative idea! It would be interesting to see how/if it was used if you deployed them for real.